A young woman reveals what she saw happening while working on Air Force bases in Oklahoma and Georgia. 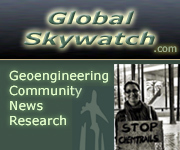 Thank you for your brave testimony about geo engineering I have been watching the chemtrails since 2002 . I have tons of photos and it has been a hobby of mine searching for airportsthat support this cause of spraying chemicals into our sky. I have beenso disturbed by it. If I could get a bumper sticker and t shirt for this cause I would ware it with pride . I live in northern california, I see the chemtrails everywhere. Even when I. Traveling up to Washington, Oregon. I see them in commercials and movies , there is always a chemtrail to be found ! The government is going to have their way ,and at the cost of our lives . Thanks for your honesty and your bravery! I’d like to know how to test my snow and rainwater for chemicals that don’t being there.